Pinot Gris truly dry and gastronomic which reveals itself at the table! Rich and rounded, although still dry, it is ideal with terrines, white meats and fish in sauce. Of all the Alsace varieties, Pinot Gris has the greatest ageing potential. Alcohol level (% vol. ): 13.35 % vol. Rich and full but still dry, it perfectly matches with terrines, white meats and fish in sauce. The most discreet of all varieties in primary aromas, it enjoys the best aging potential. After three years of extremely low yields, we can at last say 2016 has been a generous vintage! Unlike most of France, which has been severely hit by hail and frost, Alsace was probably the luckiest of the major wine regions this year. The vintage can really be divided in two halves as weather, which caused us great concern initially, then took a turn for the better around the end of June. Spring did not unfold without incident, with a few frost alerts in April and even in the beginning of May, followed by the wettest month of June (157mm) in decades! Careful monitoring of the vineyards was key with an outbreak of mildew, extremely rare in the region. The only window of bright sun during Spring came at the end of June, just in time for a perfect and, for the least, complete blossoming between June 17 and 21. Summer came out very dry and hot and harvest saw dry and cool conditions (only three real days of rain in seven weeks) resulting in perfect sanitary status across all grape varieties. Due to the late vintage, harvesting started extremely slowly on September 27, one of the latest and longest campaigns of the recent years. 2016 is the first vintage in over a decade that hasn’t seen the production of any botrytis wines at Hugel; due to the late vintage and the optimum health of the grapes, noble rot did not develop, resulting in a classic vintage for dry wines only. 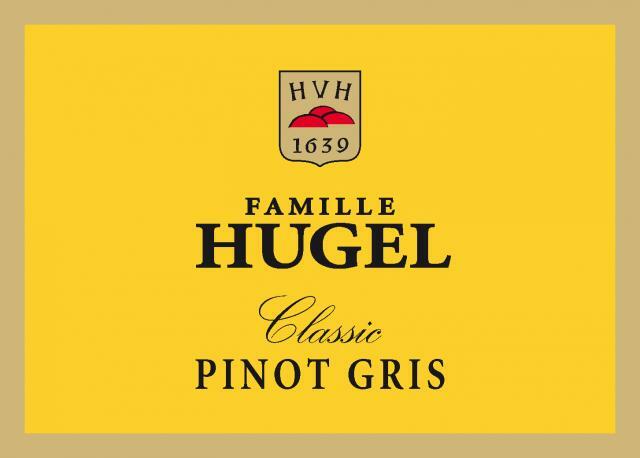 Harvested exclusively by hand from clay and limestone vineyards in a dozen of the most favoured localities in and around Riquewihr with a high percentage of estate grapes. The grapes are taken in small tubs to the presses, which are filled by gravity, without any pumping or other mechanical intervention. After pressing, the must is decanted for a few hours, then fermented in temperature-controlled vats (at 18 to 24°C). The wine is racked just once, before natural clarification during the course of the winter. The following spring, the wine is lightly filtered just before bottling, and the bottles are then aged in our cellars until released for sale. The whole production of this wine is closed with DIAM the cork without the risk of cork taint. This wine has a scintillating youthful colour with bright and intense shades of pale green, pistachio, lime tree and primrose yellows. The dense and fetching legs have a silvery sparkle. It has a powerful balanced aroma, youthfully reserved and sensitive. Well balanced and fresh odours of yellow peach, pear, Mirabelle, liquorice, fresh almond and acacia honey. On the palate its feel is sophisticated, soft, velvet, full-flavoured with a pleasant vinosity which retains a sense of expressive and aromatic refinement that is beautifully prolonged with refreshing acidity. This is a lovely Pinot Gris wine which still remains a bit young and well worth laying down. Keep it laid down for 3 to 6 years. It can still be consumed now with sea or fresh water fish with freshwater shrimp or lobster sauce, or served with spiced dishes: lamb curry, red mullet in turmeric, monkfish in saffron. With some ageing it will become an ideal companion for poultry, pheasant or other white meat dishes. Veal chops with wild mushrooms, game-bird terrine or duck foie gras. Best served at 8° C.